The defining feature of the past decade of international soccer has been the enduring struggle of two opposing forces: Lionel Messi vs. Cristiano Ronaldo, Barcelona vs. Real Madrid. Two of the very best soccer players to ever live, their abilities maximized to the fullest extent possible thanks to modern medical and training practices and each man’s maniacal drive to reach and surpass any previous notions of greatness in the sport, their talents buttressed alongside several fellow all-timers who comprised what were consistently the two best teams in the world, all showcased in what was already the most hallowed rivalry in sports. For an entire decade we’ve had the good fortune to witness the full extent of this glorious, unique time in history, the pinnacle of which has been La Liga’s biannual Clásico between the two players and their two clubs. Living in this era has been as thrilling and captivating and rewarding as anyone could’ve asked of a game in which young people run around on grass fields kicking a ball into a net. That famous era is now over, though, and there is no better signifier of this period’s end than Sunday’s Clásico, which for the first time in 11 years will feature neither Messi nor Ronaldo. Ronaldo’s absence from the match is due to his exit from Real Madrid this summer, when he forced his way out in favor of a move to Italian club, Juventus. 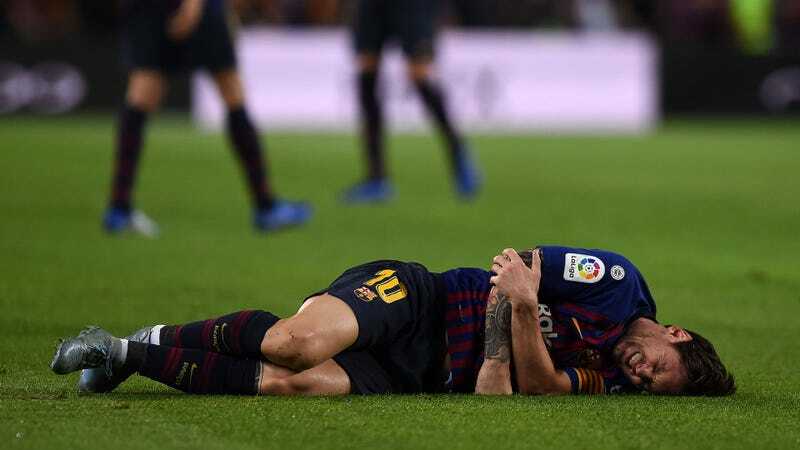 Messi won’t be able to take the field for Barcelona because he broke his arm during an awkward fall in a league match last week. But while these two superstars are still active and still unspeakably great, and while both Madrid and Barcelona are still two of the best teams in all of Europe this season, those players’ shared absence from the Camp Nou pitch on Sunday truly does mark the close of one chapter and the start of something new. Real Madrid, the more forward-thinking of the two Spanish giants, have wisely been planning for their inevitable post-Ronaldo existence for a while now—though it hasn’t made the transition anything close to seamless. Madrid’s summer was a calculated risk that hasn’t quite paid off. They hired manager Julen Lopetegui to implement a more cohesive, team-focused style of play, and rather than dip into their nearly unlimited transfer kitty and splurge on a new superstar to hopefully fill the shoes of the departing Portuguese one, they elected to stand pat and trust current Blancos like Gareth Bale, Isco, and Marco Asensio to bridge the gap. Madrid’s idea was to pivot away from a style of playing that was so reliant on Ronaldo’s individual brilliance for goals and wins, and toward something new that better incorporated each member of the team’s still stunningly deep squad. That way the team could avoid assigning some new player the impossible task of doing everything Ronaldo did and instead could hopefully build a more solid whole that could compensate for the loss of Ronaldo with each existing player chipping in more. Plus, by staying out of the transfer market this season when there was probably only one great but not historically so superstar available (Eden Hazard), they could save their powder for next summer and see if one of Neymar or Kylian Mbappé—young stars who really could be counted on to lead a club with Champions League-winning ambitions—somehow found himself on the market. While things looked good early on, Real have really struggled of late to maintain the standard demanded of a club so big. They have won only one of their past six matches, and have only just recently ended what had been the club’s longest ever goal drought of 481 minutes without scoring. Shocker: It’s hard to score when you lose a guy who scored 50 goals every year and give the bulk of his minutes to a 22-year-old kid who hasn’t scored 50 goals in his entire professional career. That 22-year-old kid, Asensio, has been pretty good but is still too inexperienced and inconsistent to be relied on for match-winning performances week in and week out; Bale has been great at times but is too often injured (another shocker); nobody still knows what Isco’s best position is, limiting his playing time and usefulness; Karim Benzema has been up and down; and the team as a whole lacks the sort of rote mechanisms and patterns of attack to consistently create and score goals at the required pace. Real Madrid are currently seventh in the league table, which is clearly unacceptable. With a loss on Sunday to their arch rivals, it’s practically a lock that Lopetegui will find himself out of a job before next weekend rolls around. So yeah, Real Madrid aren’t exactly flying right now. Barcelona have fared a bit better this season, though they too are a deeply flawed bunch. While the Messi era itself has yet to come to an end at Barça, the generation and playing style that accompanied the rise and dominance of that era is unquestionably dead. With Andrés Iniesta’s departure to Japan in the summer, Barcelona lost the most critical remaining vestige of the core that made the team as dizzyingly spectacular as it was at its peak in the recent past. By losing Xavi and Iniesta—two players born in the team’s positional- and possession-based style—and failing to replace those midfielders’ skill sets with players of similar qualities and predilections on the pitch, it is impossible for Barcelona to play the way they once did. That might not be such a bad thing, if in the place of Barça’s ideal style the club had the parts to put a different, coherent structure in place; this is decidedly not the case. If Barcelona were a car, they would be an expensively assembled Frankenstein vehicle with lots of high-quality pieces that don’t quite fit together. They have too many of certain types of players and not enough of others. All of their attacking players want to run toward the ball and make something happen with the ball at their feet and none of them want to (or, in Luis Suárez’s case, can) run fast away from the ball in order to open up space for the others. Most of their best players are old and slow and are slowly deteriorating physically. Their best young attackers, Ousmane Dembélé and Philippe Coutinho, essentially play in the exact same zone of the pitch and thus can’t really thrive on the same field together. Their midfield has lots of hard-running laborers and not enough creative artists. Most crucially, in a team that not that long ago boasted historically great players at almost every single position on the pitch, only Messi truly resides in the very highest echelon of outfield difference makers. And even Messi is no longer the same indefatigable, havoc-wreaking force he once was, though his skills remain alien enough to make this clunky Barça outfit genuine contenders to win every trophy. The Argentine genius probably still has a few more years left at a level close to his peak, but he needs much more complementary and supplementary support from his teammates than he’s currently getting if he’s to juice his abilities for every last drop of success while he still can. The Messi/Ronaldo-free Clásico and the transition out from international soccer’s decade-long defining paradigm is especially jarring for me and I assume many other American soccer fans who only took to the sport relatively recently. My complete and utter ignorance of the sport of soccer growing up is such that I have no memory of knowing what the World Cup—the World freaking Cup!—even was prior the 2006 edition. It was while watching that tournament, seeing for the first time what soccer played at the highest level looked like with all of its mesmerizing power and artistry, that the sport first got its hooks into me. As much as the sport itself tantalized me that summer, it was the play and the backstory of a fellow teenager, this kid on Argentina—the team I’d decided was my favorite, mostly due to their cool uniforms—named Lionel Messi who really captured my imagination. I saw a player so young, in possession of a talent so obviously awe-inspiring that even my virginal eyes could detect it, with such potential for world-bestriding greatness, and in him and his way of playing and his team’s verve and their fans’ passion I saw much of what it is that makes soccer the most popular sport the world has ever known. I was addicted right away. That summer I became a fan of soccer and of Messi and of Barcelona, and those combined fandoms are in a very real sense what a large part of my life today revolves around. I think something similar is true of lots of American soccer fans my age and younger. Their interest in the sport might not be as Messi-focused as mine, but the timing of their introduction to the sport and their subsequent immersion into it—thanks to things like the wall-to-wall broadcast coverage of the last handful of World Cups, the explosion of the FIFA video games’ popularity, the technological advancements that made streaming European matches on a computer easy, and the expansion of TV rights deals with American cable companies—has meant that a huge number of American soccer heads have only known soccer in this Messi-Ronaldo era. For nearly the entire time I’ve been following the sport, Messi has played for Barcelona and Ronaldo for Real Madrid and those two players and teams have been some of the best players and teams to ever exist. Today, most of the particulars of that statement are no longer true. Messi and Ronaldo are still great and Barça and Real are still very good, but in the near future Messi and Ronaldo will no longer resemble the players we’ve come to know and then they will retire and Barça and Real will be completely different, necessarily inferior versions of themselves and the entire framework around which I and many other soccer lovers have understood the sport for all our soccer-loving lives will have been dismantled by the cold and uncaring forces of time. On Sunday, Barcelona will play Real Madrid in the first Clásico in 11 years in which neither Lionel Messi or Cristiano Ronaldo will appear. Ronaldo has already almost certainly played his final Clásico. Messi’s last one isn’t far away. Soon, Messi and Ronaldo and everything their titanic greatness has meant to the sport and our lives will become nothing more than a list of stats in a ledger somewhere, a collection of memories jealously clung to by those lucky enough to see it when it was real. Not too long after that, all of us will become mere memories, too. That process—the first day of the rest of our lives and beyond—starts tomorrow. I for one will be watching, with lots of excitement and more than a little dread.